A total of 25 existing/prospective Club members, 4 friends/spouses, 4 children and a dog made it to Kelynack, near St Just, making this the most well-attended trip of the year so far. The journey down on Friday evening was remarkably trouble-free, and took a lot less than the predicted 6 hours to get to the far end of Cornwall. Most people had a glass or two of beer or wine before turning in, and it’s believed that getting 18 people into one static caravan might be some sort of record. On Saturday morning there was a very early start for those who had opted to climb Commando Ridge at Bosigran: because of the tide times, the group left at 7.15am. 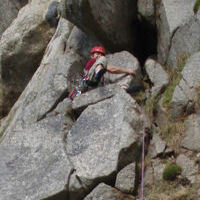 Commando Ridge was recently featured on the BBC’s “Ultimate Rock Climb” – the sight of a TV-presenter climbing novice completing the route, plus its VDiff classification, made it an attractive option for both experienced and inexperienced climbers, as well as some people who haven’t been spotted on outdoor routes for a few years. 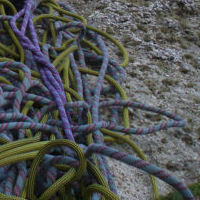 Those on the climb were Bruce, Bob, Paul, Dan, Rhoda, Emer, Mark, Paula and Graham – nine people with only seven ropes! 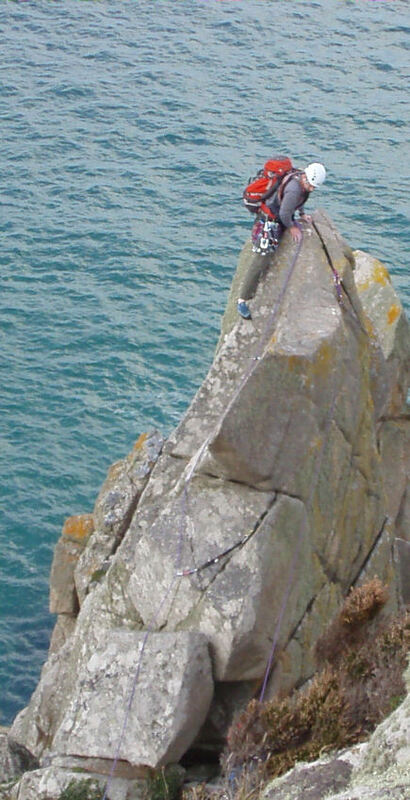 The route took longer than originally planned, but the plan was flexible: the group did one long pitch at the start and thus avoided the difficulties on the first three pitches and the risk of getting swept off the base by the sea. Then at the end they descended one pitch instead of tackling the top two harder pitches. The first major pitch was really exposed and not suitable for beginners as it turned out, but on the other hand it was brilliant and the exposure was amazing! Bob, leading, took the most direct and hardest line instead of the easier line to the left (it was noticed at Bosigran on Sunday that most parties seem to be taking the line to the left, but when he looked at it, it didn’t look as good so he went what seemed to be the most interesting way). 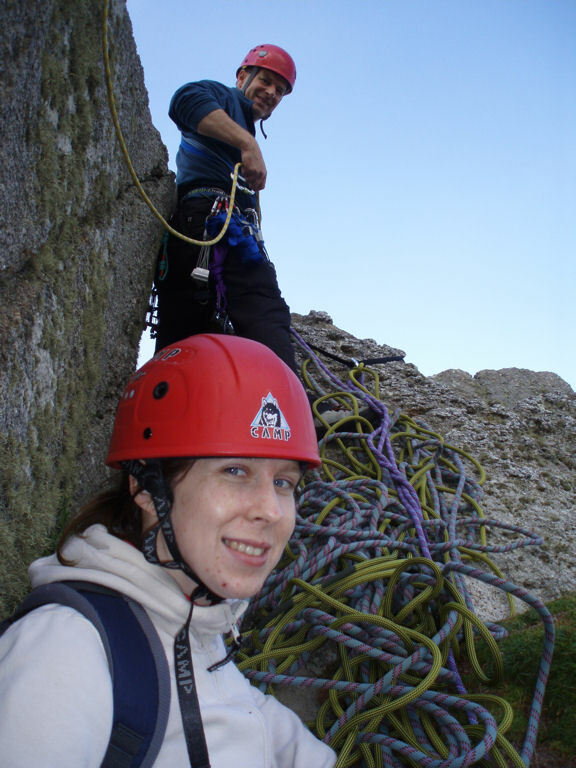 Everyone took care to ensure that everyone else was safe, by back-clipping the ropes, making space at belays and clipping each other in to safe anchor points. Because of the group size, there was a lot of hanging around (no pun intended), which became quite sociable when groups from Wessex MC caught up. One Wessex club member promised to salute Newbury every time he went past because we let him climb through us. Another two joined Bruce as he made the final descent of the exposed pitch 4 and collected up the gear. It was a great team effort, with lots of patience and good humour being demonstrated throughout, and a lot of fun. For Emer and Mark this was their first outdoor climb, so well done and also well done to Paula who hasn’t been out for some years but did the exposed pitch with only a little “disco leg”. The group finally finished, starving, at 3pm, and some went off for a swim. The walkers set out at the more civilised hour of 9.30am. 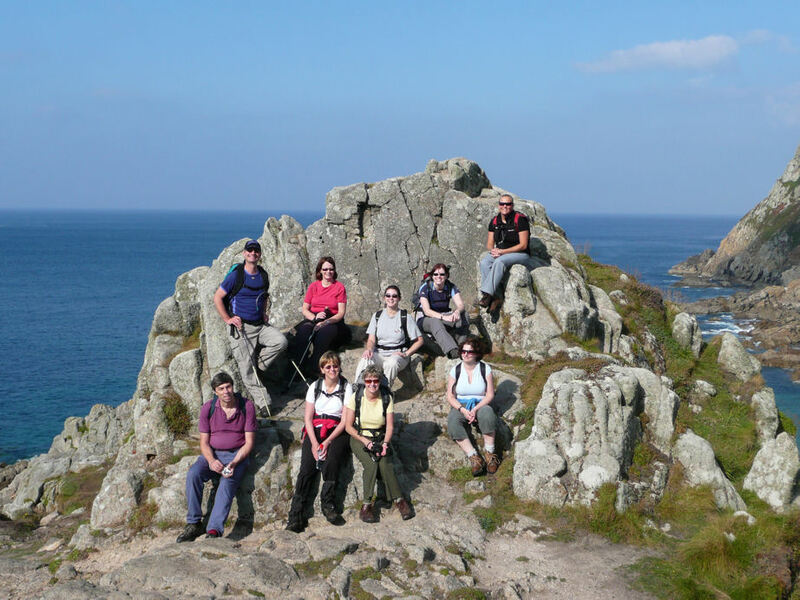 A group of eleven, led by Claire and Mike, took two attempts to locate the right exit from the campsite and then walked through St Just, up to Cape Cornwall, and along the South West Coast Path to Sennen. The Cornish coast path should not be seen as an easy option: the SWCP website describes most of this north coast stretch as “challenging” and “rugged”. The excellent weather made for wonderful views, which took our minds off the numerous ascents, descents, and rocks to clamber over. At Sennen, the group split: some had a great time in the pub watching England win against the odds and the Aussies (Alan), and others didn’t want to let a brilliant surf go to waste and braved the decidedly refreshing sea with full wetsuits and bodyboards. Apart from William who was tough enough to go in with only shorts on! After a good two hours battling the waves, the surfers were all thoroughly exhausted, with barely the energy to give Tom and Ed a boost over the waves. After toes had started turning blue, even Beckie, Marion and Julie gave up and retired for a well-deserved cream tea. Meanwhile just four people – Claire, Sarah, Maggie and Mel – were left to fortify themselves with pasties and ice cream (with clotted cream AND a Flake!) before continuing on the final stretch of the walk to Land’s End. From there they caught the open-top bus back to the campsite, a somewhat breezy experience. Richard, Keyna and Dave walked the other way along the coast path to Zennor and then returned to Kelynack on the same open-top bus (although only Dave braved the rapidly cooling temperatures on the top deck). 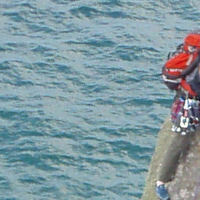 Steve W and friends opted to climb at Sennen, before joining the surfing group in the afternoon. Sunday morning followed tradition with a more leisurely start for most. Steve, Leigh, Heather, Gaby and Ness the dog set off early (before 10am) to the crags at Bosigran. Commando Ridge was obviously out, due to the dog, but there were plenty of single- and multi-pitch options available on the other side of the zawn. 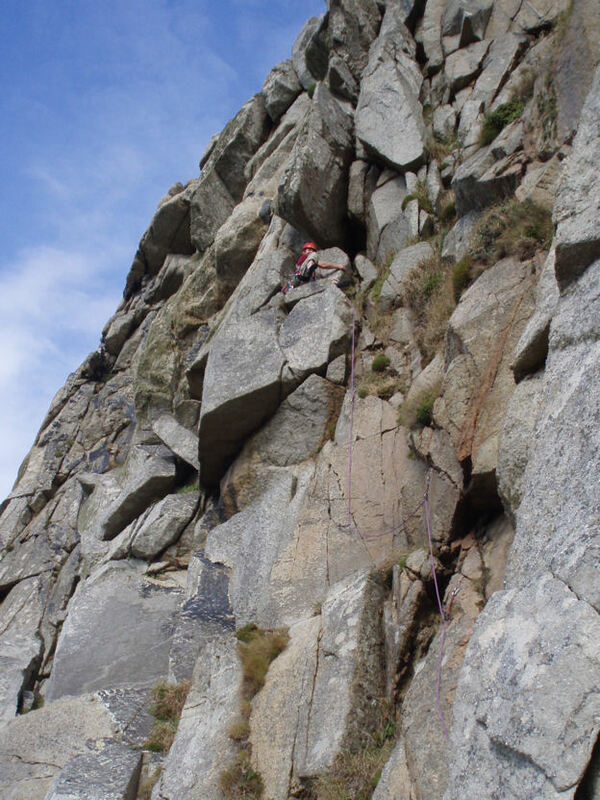 After a few goes at lifting Ness over huge boulders, we settled down at the bottom of Alison’s Rib – a wonderful 2-pitch 3* VDiff with brilliant views over the sea. After everyone (apart from Gaby) had donned enough gear for an assault on Annapurna, Steve led the classic crack line, enthusing about the quality of the rock and the great holds. The others followed (apart from Ness, who was left at the bottom crying for her daddy), and everybody agreed that this was simply excellent fun – who needs to wrestle with an E3 when you could enjoy yourself? By the time they were finished, the rest of the climbers (Bob, Maggie, Paul and Graham) had made an appearance as well, and Gaby liked Alison’s Rib so much, she decided to do it again; this time on the much more exposed arrete. Steve, Heather and Leigh went off for an afternoon’s surfing (with Ness), and Gaby caught up with Mike, fresh back from a 30 mile bike ride with Dave and Keyna. 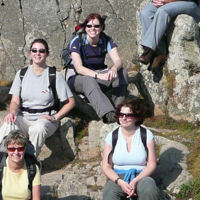 Rhoda, Paula, Richard, Mel and Emer walked from Porthcurno round to Whitesands Beach; and Alan, Claire, Sarah, Bruce, Steve and Joanne walked from Zennor to St Ives, where they rewarded themselves with cream teas before the long journey home.